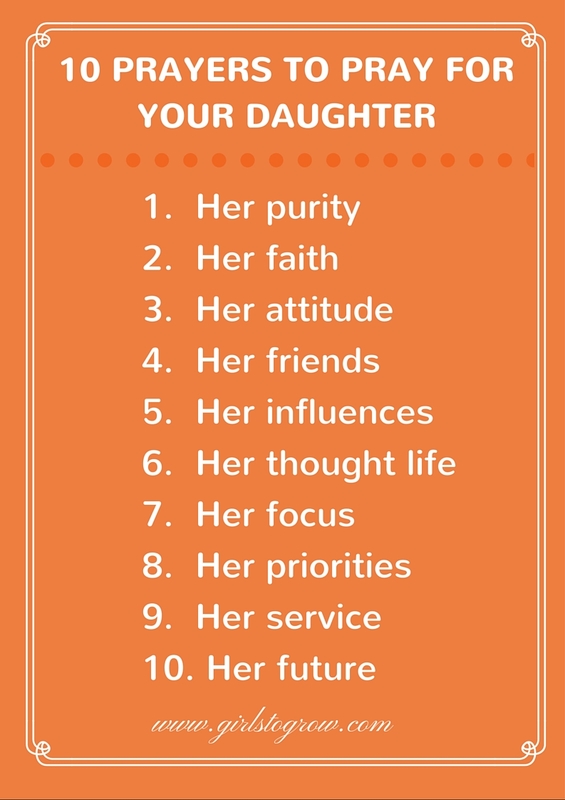 What’s one of the most important things you can do for your daughter, no matter how old she is or what stage of life she’s in? If you’ve been reading here long, I think you’ll know that my answer to that question would be to pray for her. That doesn’t mean that I’m always as faithful in praying for our children as I should be. All too often, I skim though my prayer time quickly, ready to move on to the next thing. Yet I know there is so much I want to seek God for when it comes to my daughters. I have seen prayer at work in their lives – and when I look back over my own life, I know that much of what has come to pass has been because of parents who consistently pray for me. I’ve created this list of ten areas in which I want to pray for our girls. I’m hoping that this list will be a reminder to me of requests to bring before God. I’ve included the Bible passages from which I gleaned these prayers, as I love the idea of praying God’s Word back to Him. You may also want to frame your own prayers from these verses, or add/substitute new categories that fit what you would like to see God do in and through your daughter. 1. Her purity. Ask that God will keep our daughters pure in thought and in action. Just living in our culture will expose her to wickedness and could tempt her to lower her standards of what is right and wrong. 2. Her faith. This covers her walk with God, the state of her soul. First of all, has she accepted Jesus as her Savior? That is the first step she needs to take. If she has, I can pray for her spiritual growth. Is she spending time with God on a regular basis? Is she maturing in her Christian faith? 3. Her attitude. Pray for her to have a sweet spirit. Many verses in Proverbs emphasize the importance of accepting correction and instruction, so we want our girls to have a teachable spirit as well. 4. Her friends. As women, we know the important role that friends play in our lives. In every stage, the people that our daughters choose to be around can either build them up and encourage them, or lead them away from what they should be. 5. Her influences. While friends are a significant influence, there are other things impacting her life. Teachers, coaches, books she reads, music she listens to, movies she watches – all of these are speaking into her life. 6. Her thought life. What our daughter thinks about will eventually come out in her actions. How we want to cover her thought life in prayer! What she thinks about God, about herself, and about others will cause her to make daily choices that can be either helpful or harmful. 7. Her focus. What is important to our daughter? What is she working towards? How does she use her time? We want our daughter to focus on building into her life things that will last forever. 8. Her priorities. We all know that our lives can get out of balance when we don’t put “first things first.” Focusing on knowing God, building relationships, setting good goals, having healthy habits, and developing her God-given talents are all things we want to encourage her in. Let’s pray that she will know how to keep her priorities in order. 9. Her service. I have prayed specifically for God to open doors of opportunity for our girls to serve in different ways. Then, as they get those opportunities, I pray that they will do it with right motives and for God’s glory. 10. Her future. No matter what stage our daughter is in, she has a future. Right now, my daughters’ futures include, among other things, a week of teen camp and a new school year as 10th and 8th graders. There is so much to pray for just right there!! Yet their future also may include college, a husband, a career, etc. Not a day goes by that I don’t want to pray for all that my girls have ahead of them. How thankful I am for a God Who holds all of their days in His hands! 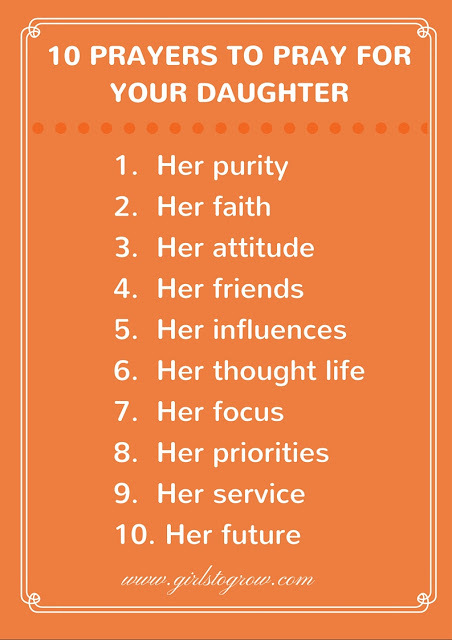 I’ve created a free printable list of these ten items that you can use as you pray for your daughter. Click here to get a printable PDF. Let’s ask God to burden our hearts to pray for these precious souls He’s entrusted to us! Hi Tracey, I saw your post on Country Girl by Stacy. Came by to see your blog. You have a lovely blog, I look forward to reading it. Thanks so much for stopping by and for your kind words! I look forward to checking out your blog as well! I am SOOO saving this list & putting it on my fridge. Tracey, seriously, everything you write is just so wise and lovely and important. I LOVE this. Am totally printing out your helpful graphic to put in my mailbox. (I pray while I walk outside, and I loop back and forth by the mailbox. I use an extra box that doesn't get used for actual mail or the paper, in case you're wondering.) Thank you for this! I came over to get the link to the post where you mention "I'm Happy For You" because I'm working on a list of new favorite things that I'm putting it on (with a link to your site, of course), and now I'm happily stuck here reading all your great recent posts. I needed that one, BTW, about us being on God's mind. Long story, but we've got some heartache around here these days and LOTS of uncertainty, so what you wrote at the end really touched me. Okay, sorry to ramble…trying to do 7 things at once! Just saw your comment on this prayer post – was out of town last week and am finally catching up on e-mails and such. So appreciate your kind words, and I will be praying for you and your family this week, for God's peace and comfort through this heartache and His wisdom and patience as you face these uncertainties. So glad God connected our paths through the blogosphere! Hello again, Tracey! I’m back on this fabulous post because I’m working on a post of my own that is a list of lists and want to include some lists from my favorite bloggers who’ve been such an encouragement to me. Naturally, such a list would not be complete without something from you. Would it be okay if I included a link to this post and your blog on that post? Feel free to say no. (Insert pout.) This won’t be out until late April…I’m just working on my base lists for now. Either way, thank you again for this beautiful piece! Such a planner you are, working ahead! 🙂 I feel like I’m barely keeping up with blogging these days, but hope to get back on track soon. I’m intrigued by this upcoming list post you’ve mentioned, and look forward to reading it! Thank you so much, Tracey! I’m honored to be able to share your words and wisdom! As for working ahead, I have to tell you it’s really just a matter of creating a placeholder for my blog, because once I get into May, it’s graduation and senior-year “stuff” ALL THE WAY. 😉 Blessings on your day, lovely lady! Just checked out the post, Elizabeth! Looks good, and gives me plenty of reading material for the afternoon 😉 Thanks again for including my post in your round-up!